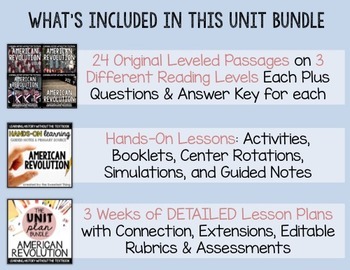 NOTE: Do not purchase this modified unit UNLESS you already own the American Revolution Leveled Passages Bundle, Lifetime Subscription to All Leveled Passages, Social Studies MEGA Bundle of Leveled Passages, or Social Studies Vol. 2 of Leveled Passages. This product listing is a special listing for teachers who have already purchased the above-mentioned passage sets so that they do not have to pay for the passage sets again. Note that the product description below is a copy of the FULL UNIT product description, but this product listing does NOT include passages. If you do not own one of these passage sets but want to purchase this unit, click HERE to grab the full unit! You do NEED the passage sets in order to use the unit. Many of the activities and lessons are centered around the passages. 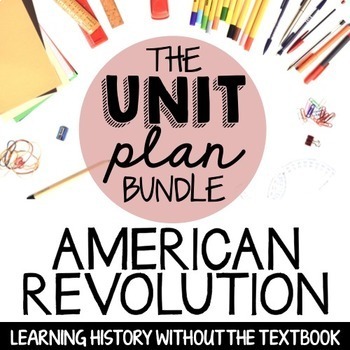 American Revolution / Revolutionary War COMPLETE UNIT: This unit includes EVERYTHING you need for an entire American Revolution unit. It includes 3 weeks of formal lesson plans (no prep print) with options to extend or shorten the length of the unit, 24 original leveled reading passages on 3 different levels (72 total), hands-on activities, simulation, guided notes, center rotations, informal assessment ideas, enrichment ideas, study guide, final assessment, and so much more. 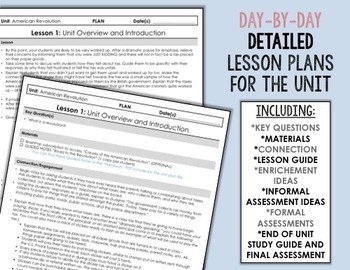 → Detailed and comprehensive 3+ Week Unit Plan including 50+ pages of printable lesson plans that include key questions, ideas for connection/engagement at the beginning of the lesson, detailed guides for the daily plans, ideas for extension/enrichment, and daily assessment. You have many options to shorten or extend the length of the unit to fit your needs. →Hands-On Learning Lessons including activities, student booklet project, simulations, center rotations, and more. Center rotation directions are 100% EDITABLE. →Assessments + Grading Rubrics including informal assessment ideas, end-of-unit study guide, final end-of-unit assessment, plus answer keys. You have the option to collect a grade almost every single day if you'd like or need! 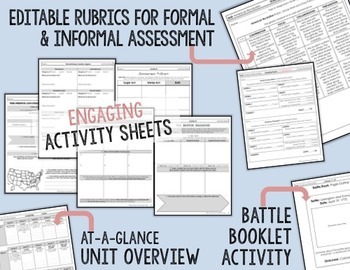 All rubrics, assessments, and the study guide are 100% EDITABLE. •What was the French and Indian War? •What was the Proclamation of 1763? •What was the Sugar Act? •What was the Stamp Act? •What was the Tea Act? •What was the Boston Tea Party? •What was the Boston Massacre? •What was the Currency Act of 1764? •What were the Intolerable Acts? •What was the Quartering Act? •What were the Townshend Acts? •What is taxation without representation? •What was the case against the King? •Who were the patriots, loyalists, and neutralists? •Who were the leaders during the American Revolution? •Who was Paul Revere, John Hancock, Samuel Adams, Patrick Henry, Benedict Arnold, Benjamin Franklin, George Washington, and King George? •How did the war begin? •What was Paul Revere’s Midnight Ride? •What was the Battle at Lexington and Concord? •What was the Battle at Bunker Hill? •What was the Battle at Saratoga? •What was the Battle at Charleston? •What was the Battle at Camden? •What was the Battle at Cowpens? •What was the Battle at Kings Mountain? •What was the Battle at Eutaw Springs? •What was the Battle at Yorktown? •What was the Declaration of Independence? Please ask ALL questions before you purchase by clicking to email me here or by asking through the Q&A tab! Thanks!